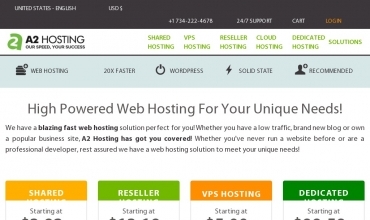 A2 Hosting is one of those companies that tries to do a lot of things and actually does them successfully. Since their inception in 2003, they have established themselves as one of the industry's leaders. They offer a wide variety of hosting plans designed to fill most needs, and they have an in-house support team they've dubbed the Guru Crew which offers 24/7 US based support. They are invested in the latest site security techniques and they employ the best servers in order to provide their users with a safe virus free experience with minimum web site down time. And since 2006 they've partnered with RatePoint, a third party testimonial authenticator to validate their reviews. They should be checked out when making your hosting choices. I am now very happy to be here! I made a move a while back and it seemed that I would have to move again but suddenly something has changed and all is well. Honest, it is all smooth sailing now, so take a look. A2 has some good points, price is attractive and their downtime has been no too bad, but they also have had problems which were detrimental to me. Fortunately they cleaned them up quickly but they do happen. I am pleased with time here, they meet the requirements I have, nothing big but still it's important to me. You would probably be fine here if you are looking for something else, so give them a try. This company has a handle on their business, They have answered any question I've had about fixing things so am happy with their solutions they have provided, I would recommend them to others. This host is fine for what I bring to the table, I'm not as complex or large as some others so maybe that has helped. Whatever it is I'm happy where I am, and plan on staying. For nine months I have used these guys. It did not take more than an hour to hear back from tech supp, and that is awesome. They definitly do make a reliable linux host in my opinion. The cpanel and phpengine were up to date and working right. I have a real issue with a2's limit of my e-mails to 200 an hour. That might sound like a lot to some people, but for me is normal. I have had some problem with php scripting too. The techies have not been able to help me with it at all. I guess people that have small and simple websites would be happy with a2. A2 is reliable for me, they are not the ideal but I odn't know who is. Anyway, am going to be here for a while as I just arrived, so far so good. Will keep you updated if it takes a turn for the better or worse. The web end of things is fine; no problems. But what, may I ask, is the point of a website WITHOUT email?